Maine! 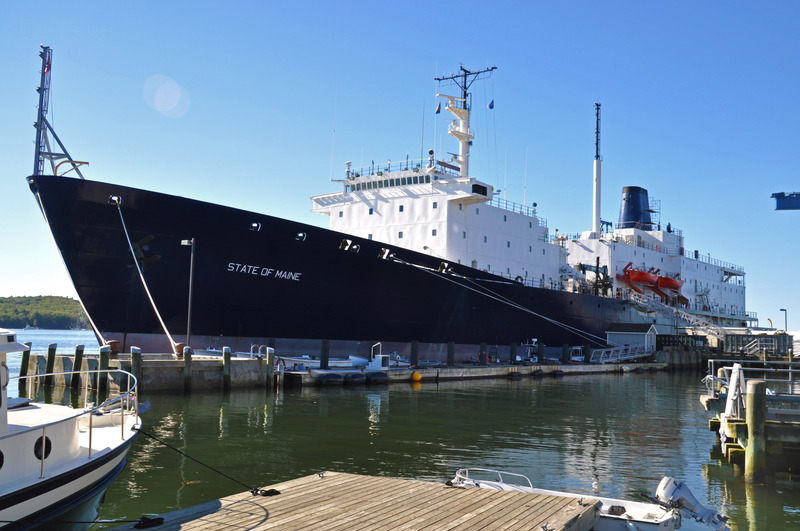 The great vacationers destination—plus the headquarters of L.L. Bean! When my mum was a kid, she and my grandparents would spend a few weeks of the summer visiting a lakeside cottage. Now, my parents like to steal a few days of the summer to go revisit the memories and visit friends. 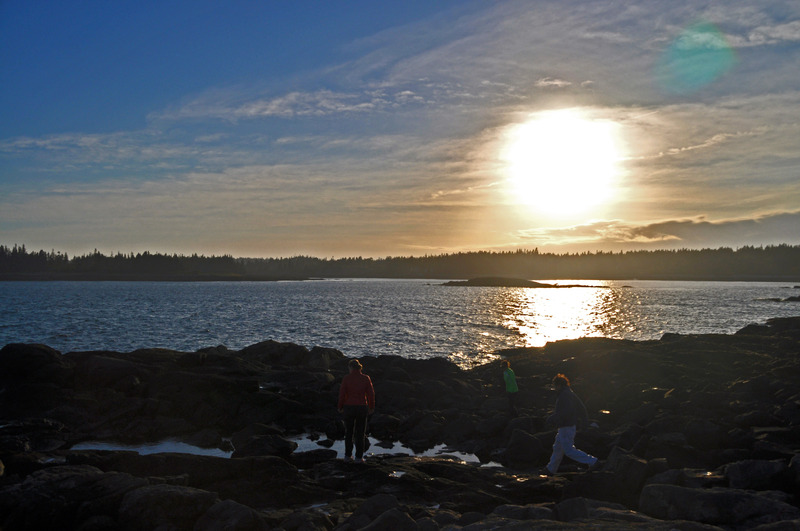 This trip included stays at two friend’s houses in East Blue Hill and on Vinalhaven Island. Our adventure included mountain biking, hiking, and much lobster gobbling. We began with a visit to East Burke, VT to the infamous Kingdom Trails. You can find the site here. The three hour biking adventure resulted in a few scars on my part. One is shaped like a Nike Swoosh on my left leg. I think it makes me look tough. Nonetheless, our crew had a blast and the soreness lasted for the rest of the trip. 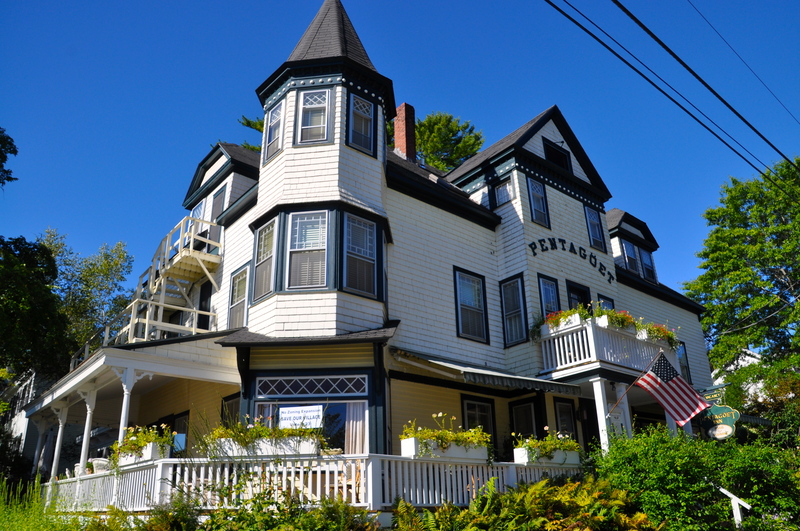 After our jaunt to VT, we crossed into Maine and to visit friends of ours who live at the Pentagoet Inn in Castine. The owners, Jack and Julie are the most darling people. Julie owned a pastry shop in Philadelphia where my mum worked in her youth. The two of them moved in together in South Philly before mum moved abroad. Jack worked with refugees in desperate situations and has the most fascinating stories to tell. The two of them make a fantastic duo and the best hosts a guest could ask for. Jack mans the Passport Bar, which is decorated by portraits of world leaders and transplants you to another place and time. Julie is the executive chef and whips up incredible flavors with the local produce as the centerpiece. I wish I had taken more photos to share, but the rooms are just darling with antique furniture and a homey, loved feeling about them. We were sad to spend only one night. The next morning after a brisk walk to the lighthouse and back, we headed off to Acadia National Park. The views were breathtaking, and the hike fairly mild. 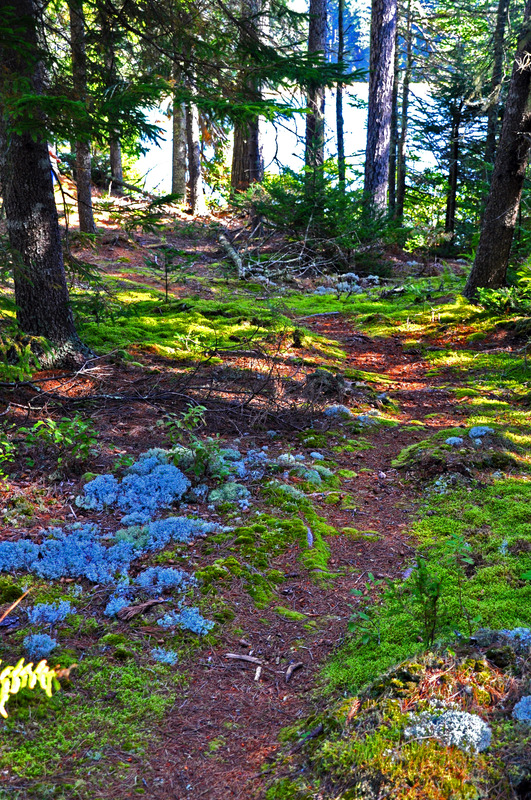 Acadia is crowned by Cadillac Mountain—a rocky, mossy landmark. We took the two hour hike, parking at the top to expedite the trip. Good friends welcomed us into their homes with a tour of the recently constructed Kiln and a great firewood-stacking endeavor. Nothing like industry to pique hunger! 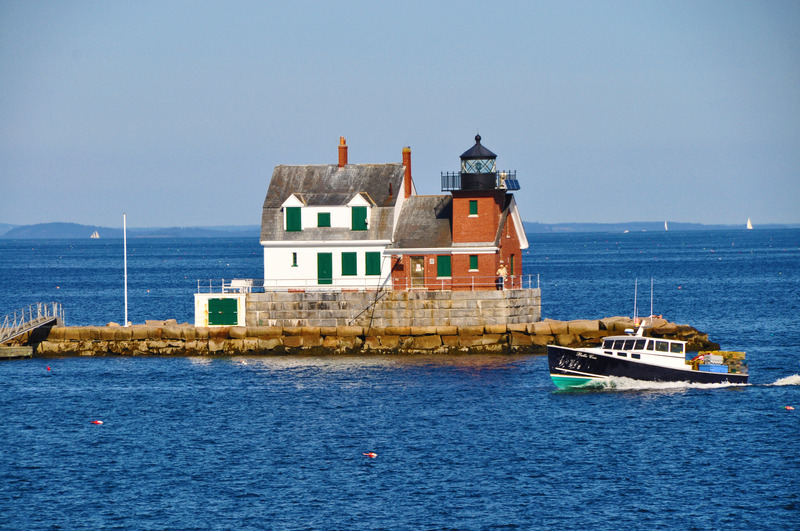 After a grand meal and a night’s sleep, we left for Rockport and the Vinalhaven ferry. 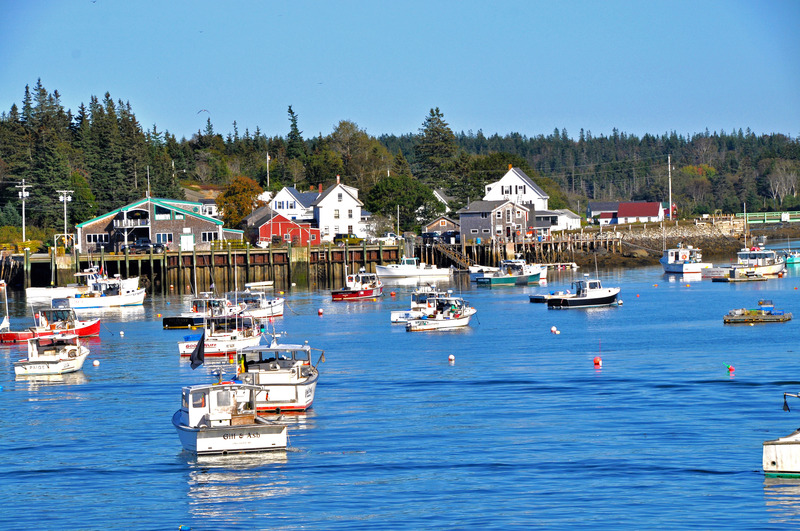 Vinalhaven is an old mining and fishing island, which hasn’t changed much over the years. Since the car we took across the ferry was loaded with supplies, all but two of us rode our bikes the twenty minutes to the house. The island was just beautiful. Below are two pictures I took while out on a walk. 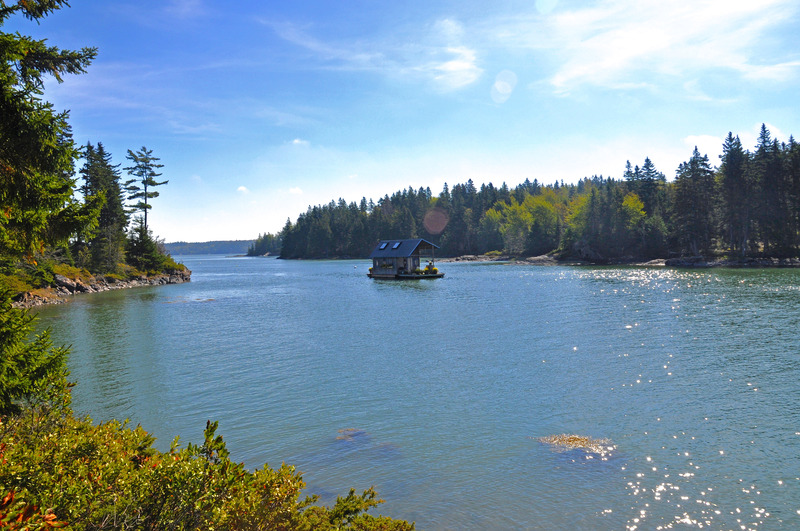 One showcases the greenery and the other is of a house resting in the middle of an inlet. Two nights and three lobsters later, we said goodbye to the island and headed back to PA.
To see what became of the lobsters, check out my instagram below! There seems to be a deluge of students heading to London. I wanted to put together a list of my top spots for a couple of close friends heading there this fall. These are in no particular order than how I thought of them. Victoria and Albert Museum: The V&A is a huge art and design museum located in South Kensington. It has brilliant exhibits on genres from fashion to ancient art to even textiles and iron work. Furthermore, it’s free! Churchill’s War Rooms: Centrally located, this is the bunker in which Churchill resided during WWII with his commanders and staff. I spent nearly three hours here, perusing through Churchill’s past and the characters that lived with him. Regent Street: Shopping galore! This street runs from Piccadily Square to Oxford Street and is great fun to walk through. Make sure to visit the four-story flagship store for Burberry at 121 Regent St.
Camden Town: Quirky and off the beaten track, Camden town is a bit more down to earth than the usual tourist attraction. The old river locks have been turned into a maze of a shopping adventure. Life size metal horses, international cuisine, and an alternative style all mix to make Camden Town a must-see. Ministry of Sound: Go dance. For hours. Ministry of Sound has the best sound system in the world and some of the best DJs as well. Open til 6am, there are five separate rooms, four bars, and students get 5lbs off the door price. Cirque le Soir: It gets wild. Both an underground club and a circus, Cirque lets in only the most exclusive crowd and is pricey. Go for Wednesday night’s hop hop party and ladies before 11 get in for free. Night Run down the Southbank to the Tower of London: The Thames is most beautiful at night when all major landmarks are lit up and the bridge’s lights swoon gracefully. My route began near Westminster and circled over the London Bridge. If you aren’t a runner, then walk and you can grab a couple of drinks along the way. Harrod’s: Grandeur! Harrod’s is for people-watching. The people you find here are just as interesting as the Camden Town crowd, but here, they are glamorous. Harrod’s is a place to find everything- fashion, food and drink, and Diana and Dodi’s Memorial. Plus Egyptian Steps! You’ll see what I mean upon arrival. Have you ever worried about the way social media interacts with you? Sure, the average America spends 23 hours a week emailing, texting, and using social media, but have you ever thought of how this effects our generation? 54 percent of survey respondents said they have tried to decrease their reliance on technology, but studies showed that in fact, usage went up. This constitutes 14% of our week! Think about all the human contact that is lost by way of an average of five hours per week spent on Facebook, four hours on YouTube, and rising interest in other platforms. For me, I see social media as a good way to keep in touch with, and out of touch with, old buddies. It is scary when I run into an old school friend and inadvertently I know exactly what they have been up to. I know where they traveled, which concerts they saw, who they are dating, and ect. All of this without a single human interaction. Is this a relationship? Of sorts, I suppose. But, this stream of data has lost touch with what matters. I have over 1,400 Facebook friends and yet I probably only care about 100. Or even saw 75 of them in the past year. Facebook has become a site to receive a personal ego boost for each photo and “clever” comment you post. Would you post something which you didn’t expect to be rewarded with a showering of “likes” from your friends? I had a discussion on the bus the other day about this. The guy I was talking to said he always judged his posts by how many interactions he got. If nobody liked his post, then he would take it down, disappointed in the lack of attention. I know that when I have over a certain amount of likes, I get a little boost in my stride. But is it all a popularity contest about bragging and public appreciation? At times, I am able to reconnect with friends across the globe and in these instances, I think that FB still holds value. But I am not surprised at all that social media usage is causing depression and multitasking may lead to greater health risks. If we continue to increase our daily consumption of social media, then our lives become diminished by lack of interaction with the real world. I think that in the future there will need to be help for those whose lives are not lived in the physical world. Afterall, who do you know that posts unattractive representations of themselves? Online is not real, nor is it a good place for one’s self esteem. 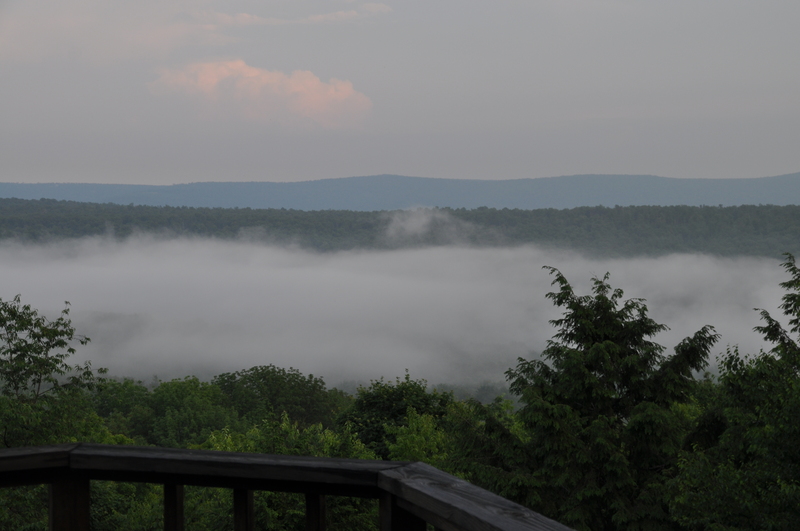 The real world is wonderfully, chaotically unedited. Be a part of it. This is one of my last day in the States for awhile. How fantastic that we are able to celebrate~ and Kodi looks so stylish! This year we celebrated with the lovely residents of Eagles Mere, Pa. 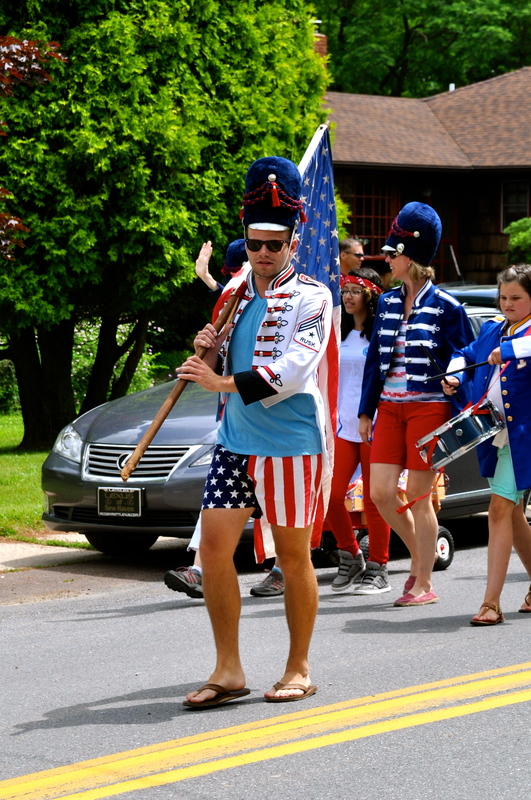 The Eagles Mere Fourth of July Parade usually has more participants than viewers and is an event of cheer, color, and patriotism. The fire engines are out in full force and the kids climb over them like little monkeys. Adults and monkeys alike delight in the showers of candy raining down upon gleeful spectators and participants. This snazzy Sir was leading the fun! 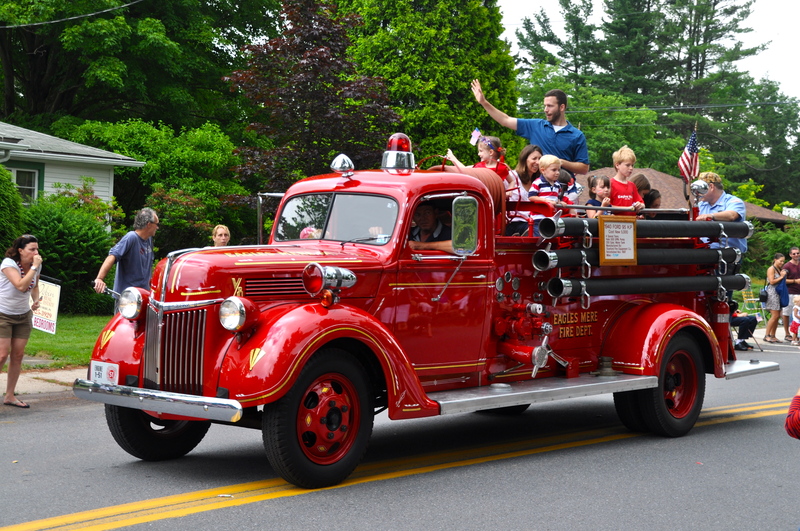 Wishing everyone a great Fourth and a grand summer! It seems everyone is talking about the 10,00 hour rule these days. Let’s dig a little deeper. One of the best journalists of our time and a favorite author of mine, Malcolm Gladwell popularized the concept of an expert being someone who devotes 10,000 hours of his time to the mastery of a skill. He also illustrates throughout the book that no one achieves success solely based on their intelligence or talent, but rather whether they were born at the right time with the proper support along the way and the proper time investment. Ericsson points out that another key to success is the synergy with a coach or mentor. These three ideas (deliberate practice, greater than 10,000 hours spent, and successful coaching) are integral to the creation of an expert. But they did not find that 10,000 hours was the “magic number for greatness” that Gladwell claims. A more recent study published on this subject was at Michigan State University by Zach Hambrick, associate professor of psychology. He too, focused on musicians and other performers because of the quantitative nature of their work. He found that reanalyzed data from 14 studies of top chess players and musicians. They found that for musicians, only 30% of the variance in their rankings as performers could be accounted for by how much time they spent practicing. And in chess players, practicing was only credited with 34% of their level of player. While one player became a grandmaster in as few as two years; another achieved that level only after 26 years. I remember nearly a decade of my piano teacher grilling: “practice makes perfect” into my head. Well, there is some contention: today, I am still a terrible pianist. But what we can learn from these three sources is that hard work, focus, and circumstance do seem to be the three pillars to mastery. In university, I devoted my studies to Finance and the Chinese language and culture. So when I went to study abroad in China, everyone half-expected it, but I still received poignant remarks about eating chicken feet and being safe with a different government and a different set of rules. 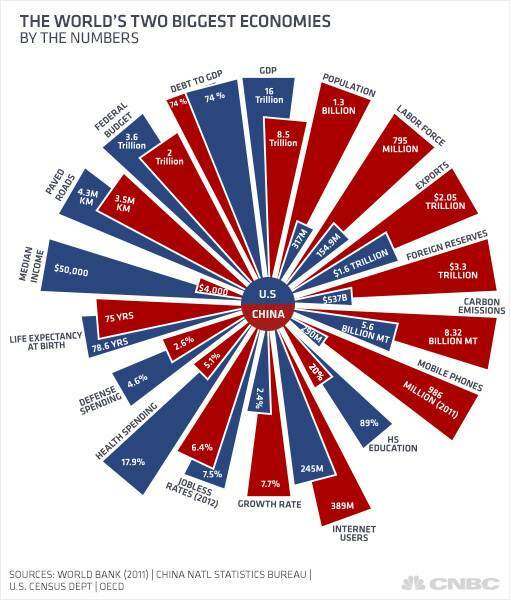 What bothered me the most, however, was when people said that China was “taking over the world” or warned me about the restrictiveness of the Chinese government. I had a brilliant time traveling through Beijing, Shanghai, Hong Kong, Macau, and even Hainan “the Hawai’i of China.” I had a life-changing job, studied at a top international university, met an incredible network of people, and developed a love for the people (and food) of China. I would recommend this study abroad experience to everyone! I found this infographic on Richard Brubaker’s site. Richard is a man renowned for this experience as a consultant and teacher in the Chinese landscape and I have found his work and blog to be a true thermometer to ideas and movement in China. We have numbers thrust upon us everyday, from every new source imaginable. Sometimes an illustration of the culmination of these ideas puts things in perspective. It is summer! And that can only mean one thing: mojitos! These guys take a little bit of work and a lot of lime-squeezing, but are certainly worth it. Come one come all! Let the summer nights commence. Recipe for 2 people- tall glasses! To make the simple syrup: boil 1cup of water then add two cups of sugar, bring to a boil again to make sure the sugar is melted. Take off the heat and add mint leaves. Cool in the fridge. 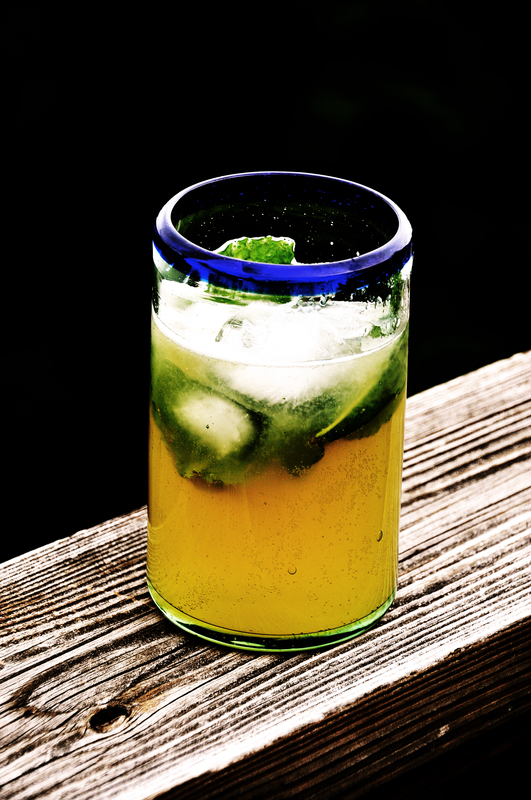 To prepare: squeeze your limes for all their worth, mix in soda, rum, and simple syrup in a pitcher. Prepare the mint sprigs by plucking off the leaves and twisting them between your fingers, then mash them with ice in the bottom of your glasses. I love to scuba dive. Our most recent family trip was to Curacao. It was relatively easy diving and the coral reefs were spectacular, but there wasn’t much in terms of large aquatic life. What set Curacao apart was the Dutch architecture, especially of the capital: Willemstad. Curacao is part of the Dutch Antilles and means “heart” in Portugese, referencing its location as a central trading post. The Dutch West India Company founded the capital on the banks of an inlet called the ‘Schottegat’. 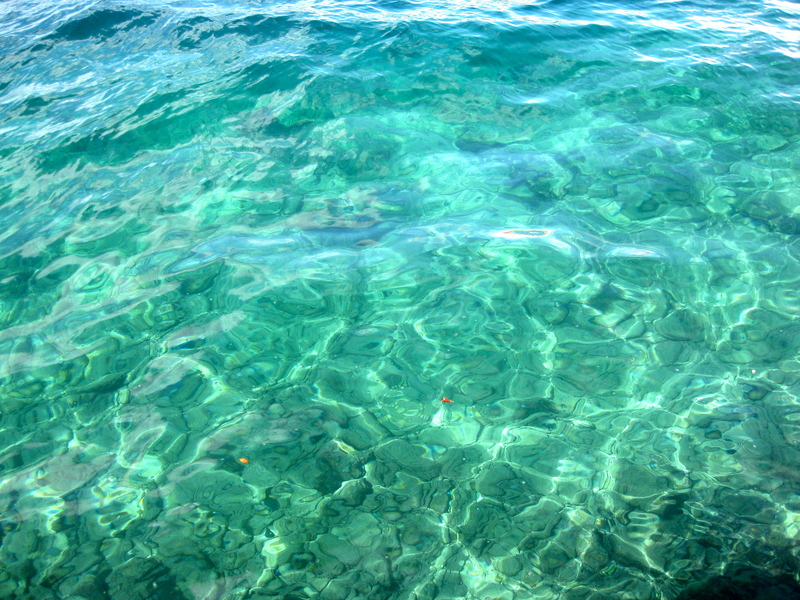 Curaçao had been ignored by colonists, because it lacked gold deposits. The natural harbor of Willemstad proved to be an ideal spot for trade. Commerce and shipping — and piracy—became Curaçao’s most important economic activities. In addition, the Dutch West India Company made Curaçao a centre for the Atlantic slave trade in 1662. 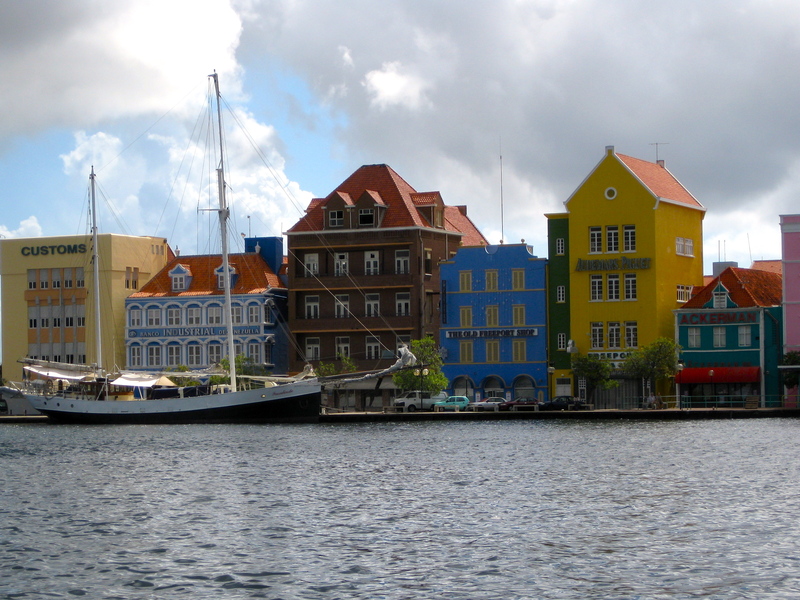 Wilemstad is now an UNESCO world heritage site. By age 10, I had been abandoned by my parents in their dive boats countless times. Which frequently meant being put under the care of the local childcare. This was bad news for the locals. My fellow abandoned scalawags and I had been on this rodeo once or twice. I have fond memories of pulling out fence posts of daycare centers, wiggling past nannies and scattering, only to meet up at a designated hangout later, and other shenanigans. Probably our worst offense took place in Fiji. I was 10 years old at this point and had gone on quite a few dive trips where the parents took off leaving the kids in the somewhat unprepared hands of the local staff. This time, one of the adults had the genius idea to bring walkie talkies. We made full use of them, dividing up into two teams and leaving our nannies in the dust. You can imagine there were ten of us, separated into groups of five and linked by our walkie talkies. The local staff just wouldn’t leave us alone however, so we devised a plan. I went into the bathroom. A few moments later, I started screaming at the top of my lungs “spider, spider!” Our two caretakers went rushing into the bathroom to save the day as I went flying out. My co-conspirator then slammed the door shut and popped the latch, holding our captivators inside. We were then free to spend the rest of the day exploring the island and doing as we pleased. What awful children we were! I’m passionate about entrepreneurship, travel, and going beyond the ordinary. I do tend to be a bit goofy at times, but stick with me here. This is a chance to flesh out my ideas and let my post-graduate self connect with the world of social media. Please leave comments- I would love to hear from you and…. I hope you find inspiration in my adventures and misadventures!